In two recent customized workshops a participant asked how to handle a request from an executive to provide just one single slide, instead of a full presentation. In this article I’d like to share my advice if you receive such a request. First of all, let’s discuss why an executive makes this type of request. I heard this type of request over two decades ago when I was an employee in the corporate world. I was working for the CFO at the time and he said to not give him more than one page on any topic as he just didn’t have time to read more than one page. We were dealing with memos at the time instead of PowerPoint slides, but the request comes from the same place. Busy executives are dealing with so many items that they don’t have the time to wade through all of the details of every issue. They need their staff to provide just the most important information required for them to understand the issue and make decisions related to it. That is why they ask for one slide, not a full presentation. Once you understand what the executive really needs, it becomes easier to figure out how to create that one slide. First, realize that the slide they are asking for is not for a presentation. It is more of a document that they can quickly review and be up to speed on the topic. So the one slide will not necessarily observe all of the best practices for slides in the same way as a slide intended to be presented. I suggest that you can still apply the same approach as for other slides though. If you can distill the topic down to one point you need the executive to understand, create a slide that has a headline summarizing the point and a visual that illustrates the point. This is what I teach for creating slides that will be presented to an audience. If you have more than one key point you need the executive to understand, divide your slide into sections. You can divide a slide in up to four sections if needed. Treat each section as a slide on its own. Write a headline summarizing the point and create a visual that illustrates the point. The text will be smaller than it would be for presenting to an audience, but since this is a document, that is fine. If you need the space, remove the overall slide headline space so that each section can be a bit larger. Once you divide a slide into sections, the text and visuals tend to get quite small, so you want as much space as you can get for each message. To make each section stand out, I suggest using light dotted lines to separate the sections of the slide. This way, the executive will know what content supports which message on the slide. 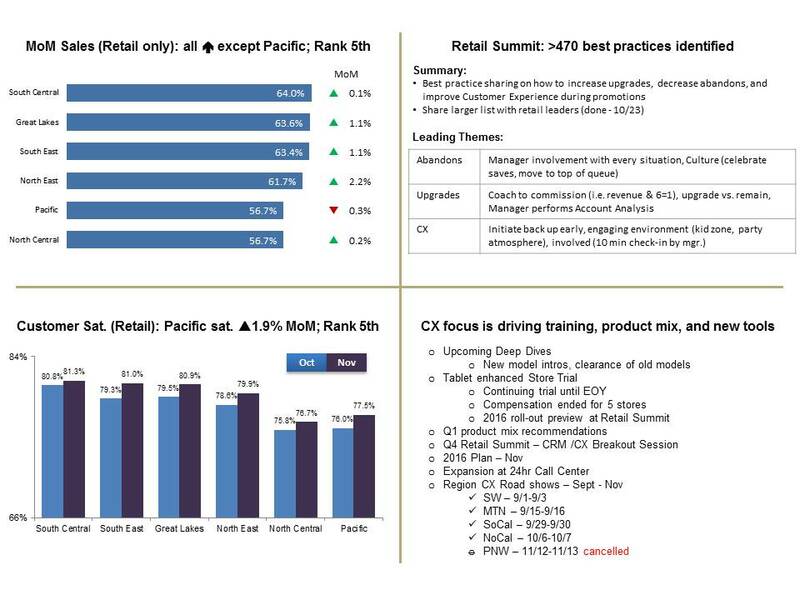 Here is an example of a single slide that communicates four key messages about performance in a retail setting. When you are asked for only one slide by an executive, remember that they are really asking for a one-page document. Use the space on the slide to communicate just the key message(s) the executive needs to know. Approach each section of the slide like its own presentation slide, with a headline and visual to make the message clear. It is not the ideal communication vehicle, but one that staff are increasingly being asked to prepare.